Title: The Tragical History of Doctor Faustus. Edition: The ‘A’ Text, from 1604. Language Difficulty Rating: 4 (slightly difficult), except for the opening scene, 7. Setting: Wittenberg, Germany; Rome, Italy. Here we present the most famous drama from the Elizabethan era not written by William Shakespeare. Doctor Faustus was published frequently in the early 17th century, the earliest edition appearing in 1604 (the ‘A’ text): this version has been historically believed to be the closest in form to the original, as written by Christopher Marlowe; recent scholarship suggests however, that a significantly longer version, printed in 1616 (the ‘B’ text), might be the more “accurate” version. The question will never be fully settled. We have decided to annotate and publish the ‘A’ text for ElizabethanDrama.org; the ‘B’ version will appear one day in the future. Our Story: the famous theologian Doctor John Faustus is spiritually unfulfilled with his chosen vocation, teaching and debating at the university in Wittenberg. 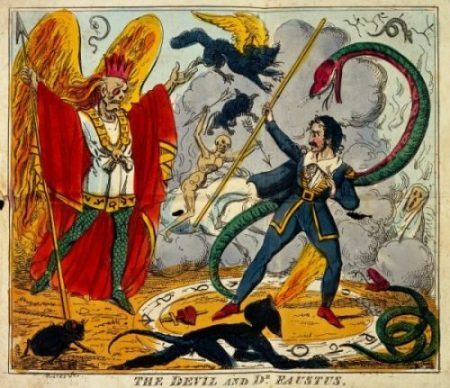 So, he makes a deal with the devil: if Lucifer will give him the power of sorcery and the ability to discover the secrets of the universe for a period of 24 years, Faustus will give the devil his soul.